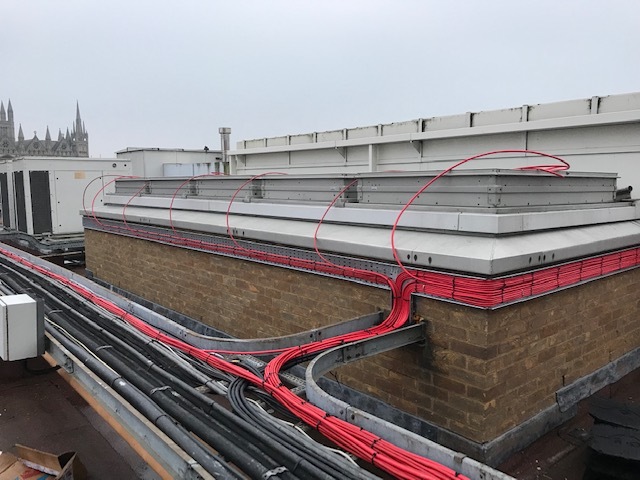 After providing mechanical and electrical services on several projects within the Queensgate Centre, Princeenergy successfully tendered for the upgrade of the extensive smoke ventilation system. As a leading retail destination in the Peterborough area, with a selection of 105 stores, Queensgate work hard to maintain a modern and safe environment for all visitors, tenants and staff. Working alongside other fire prevention measures in the centre, the smoke ventilation system removes smoke from the building in the event of a fire and keeps exit routes clear, enabling the safe evacuation of the centre. The new system is a natural smoke and heat exhaust ventilation system that complies with BE EN 12101-2, this will remove smoke and hot gases as well as providing replacement air in the event of a fire. 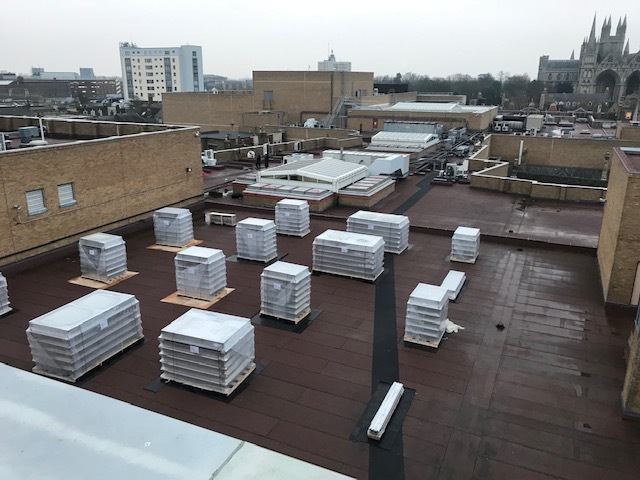 The project saw the replacement of 96 roof ventilators in total, replacing the existing pneumatic smoke vents with electrical ‘Seefire’ smoke vents. These will be controlled by six ventilation control panels. The vents will be activated in zones when the corresponding fire alarm signal is received by the Colt OPV unit. In the event of mains power loss the system is backed up by six batteries to ensure ventilation can be maintained. The new system will feed into the main Building Management System which will give feedback on each individual vent, alerting the centre via the display panel to any issues without the need for manual inspections. The replacement of the vents could only take place outside of the centre’s opening hours as once they are removed they leave an open void in the ceiling. A fixed man safe system was in place throughout along with tool lanyards to prevent anything being dropped to the floor below during the replacement work. The project was completed on schedule and to budget.